Shankar made his ODI debut against Australia at Melbourne and featured in three out of five ODIs and all three T20s against the Black Caps. 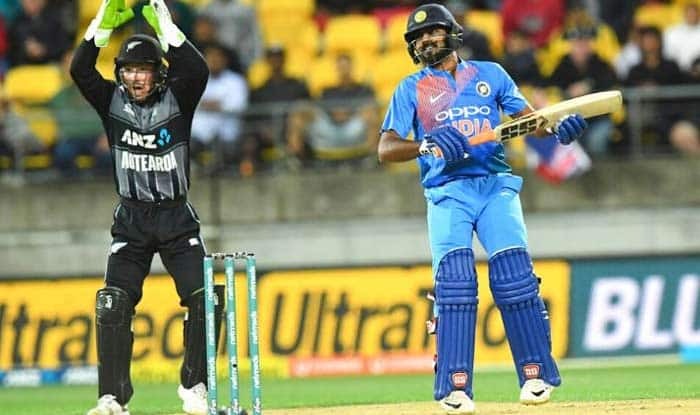 India all-rounder Vijay Shankar on Sunday said being promoted to bat at the crucial number three position came as a big surprise to him and he returns home from the maiden tour of Australia and New Zealand as a much-improved cricketer. Shankar batted at number three in two of three T20s against New Zealand, scoring 43 off 28 balls in the final game and 23 in the series opener. He made his ODI debut against Australia at Melbourne and featured in three out of five ODIs and all three T20s against the Black Caps. The 28-year-old might not have done enough to stake a strong claim for a World Cup spot but gave a good account of his all-round abilities. Going forward, Shankar said he would love to bat higher up the order. “It was a big surprise for me when they asked me to bat at three. That is a big thing. I was focussed on playing the situation. You need to be open anyway if you are playing for a team like India,” said Shankar after his team’s four-run loss in the third T20. “These (Australia and New Zealand) two series I have learnt a lot. I might not have bowled a lot but I learnt to bowl in different conditions. In batting, just watching seniors like Virat (Kohli), Rohit (Sharma) and (MS) Dhoni, how they go about their job, I learnt a lot.” The fact that he had come to New Zealand with the India ‘A’ team in December also helped him. He got starts in all three innings in the T20 series but could not play a match-winning knock. “Even the last game was a learning experience for me. I could have gone for single or a two than go for another boundary,” Shankar said.